Acronis, a global leader in hybrid cloud data protection, has announced new solutions that give businesses and IT Managers more control over company data and workloads than ever before – including where they can be backed up, stored, monitored, and recovered. Including Acronis Notary which delivers ‘tamper-proof’ data storage leveraging Blockchain technology to ensure data authenticity, privacy and control. Acronis will apply Blockchain technology to its solutions, which provides a record of digital events distributed across different participants or entities, and opens up a broad range of new data protection use cases for businesses worldwide. With Blockchain, data and transactions can only be updated by rules of consensus between participants in the system, and when new data is entered, it can never be erased. Acronis solutions leveraging Blockchain technology are scheduled to be available in October. You can see an online demo here today. Data is the lifeline of every business – without it businesses cannot survive in today’s digital world. Data must be protected. Acronis is helping businesses and IT Managers meet this modern day need with an expanded set of solutions – Acronis Backup 12, Acronis Backup Cloud, Acronis Monitor, Acronis Storage, Acronis Notary – that are based on the company’s new hybrid cloud architecture to support data protection and recovery in virtually any IT environment. According to IDC, data continues to grow at a 40–50% compounded annual growth rate. At the same time, IDC notes that a company’s data may migrate from system to system, across storage platforms, and across on-premises and off-premises repositories all within the course of a normal business day. Traditional data protection methods are not well equipped to protect and recover this transient data, and IT consumers are looking for products that can more adequately do so. Acronis provides businesses with the ability to take back control of their data destiny by extending beyond backup solutions to provide omplete data protection across hybrid cloud IT environments. Acronis enables businesses and IT Managers to store their data anywhere and monitor activity at all times to quickly identify and resolve performance issues. Acronis solutions feature a unified web management console that makes it easier than ever for IT managers to converge cloud and on-premises data protection with the ability to monitor and manage all data and workloads. Acronis solutions can be deployed in the cloud, on-premises and in hybrid configurations, protecting company data across the entire business – whether it resides in the cloud or with cloud applications, on-premises, across virtual and physical systems, in remote systems, and on mobile devices. 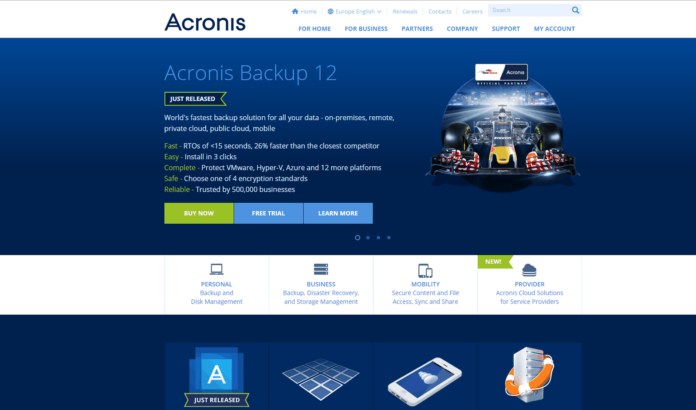 Acronis Backup 12 – World’s fastest backup protects the entire business, backing up data on-premises, in remote systems, in private and public clouds, and on mobile devices – available now. See related press release here. Acronis Backup Cloud – Built to easily fit within service provider environments with a comprehensive, yet simple, complete, and cost-effective hybrid backup and recovery solution that solves their customers’ data protection problems. Available now, click here for more information. Acronis Monitoring Service – Enables IT managers to monitor servers, networks, applications, and web sites with ease to identify performance problems, and make smarter IT decisions. Available now, click here for more information. Acronis Storage – Provides software-defined storage that supports any type and volume of data with reliable, resilient, self-healing features, enabling service providers to use cost-efficient, commodity hardware. Available in September, click here for more information. Acronis Notary – Delivers ‘tamper-proof’ data storage that leverages Blockchain to ensure data authenticity, privacy and control. Acronis will apply Blockchain technology to its solutions, which provides a record of digital events distributed across different participants or entities, and opens up a broad range of new data protection use cases for businesses worldwide. With Blockchain, data and transactions can only be updated by rules of consensus between participants in the system, and when new data is entered, it can never be erased. Acronis solutions leveraging Blockchain technology are scheduled to be available in October. You can see an online demo here today. Acronis customers can select subscription-based pricing or perpetual licenses to protect any infrastructure, including physical, virtual and cloud. For service providers and cloud resellers, Acronis delivers a set of multi-tenant, multi-tiered solutions that provide automation of services and complete control of provisioning, billing, monitoring and management, enabling partners with highly scalable solutions that can support millions of end users. All Acronis solutions, including Backup, Disaster Recovery, File Sync & Share, Storage and Monitoring, are powered by the Acronis AnyData Engine – a set of unique, deep, and powerful data protection technologies that capture, store, recover, control, and access any data from any location. Acronis has over 5,000 petabytes of data under protection from over 500,000 business customers relying on Acronis because they just need data protection that works. For partners and service providers that want to learn more about Acronis solutions, click here for more information.